May 30, 2013, 9:36 PM · What motivates and inspires a committed young violinist to practice extra hours, to seek a demanding teacher, to strive toward becoming a true artist? 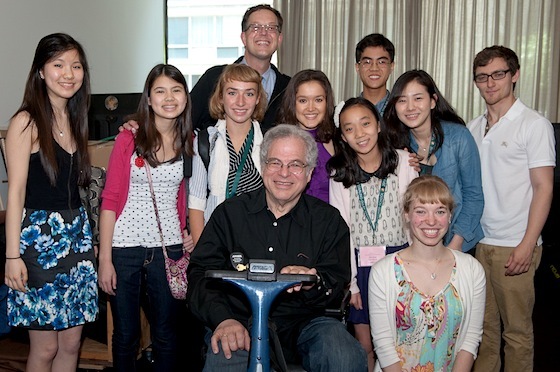 The ten young artists who are performing for master classes and recitals this week explored these questions -- answering with a good deal of wisdom -- during a panel discussion Thursday morning at the 2013 Starling-DeLay Symposium on Violin Studies at The Juilliard School. Symposium Artistic Director Brian Lewis moderated the discussion, first asking the young artists how they came to play the violin. Their answers varied: many had parents who were musicians ("I really wanted a long black dress, like my mom!"). Others had parents or relatives who were committed to having their child learn an instrument. Others showed a great love of music early on, singing and begging for lessons from a young age. "Did any of you start with the Suzuki Method?" Every single one of them raised a hand! Left to right: Moderator Brian Lewis; Eric Tsai, 16; Emily Shehi, 14; Gloria Ferry-Brennan, 16; Marié Rossano, 19; Angela Wee, 16; Elli Choi, 11; Ji Min Lee, 24; Robyn Bollinger, 21; Ji Won Song, 20; and William Shaub, 20. What keeps them motivated now? "I love making beautiful music," Eric said. "I don't think I like anything as much as I like playing the violin." Some said they were motivated by their teachers or orchestra conductors. "I love the goosebumps you get when something goes really well," Angela said. "The way the audience enjoys my playing motivates me," said Elli. "When the audience claps for me after I play, I always feel reborn in that second." Ji Min said she was motivated by the dedication of her teachers and colleagues, "having people around tho are hard workers." Robyn said she was motivated by some of the outreach she and fellow students at New England Conservatory did after the bombings in Boston. "I can't tell you how moving that was, to express for others, things they can't express themselves." Ji Won said that for her the violin is a substitute for her voice. William felt music had opened doors for him, and "I feel a responsibility to defend and protect our tradition for future generations." Do they listen to anything other than classical? Well, two said they only listened to classical, but the others had eclectic taste. Here are a few of the things they said they liked: Lady Gaga (okay, that was Brian Lewis), pop, Pink, Sinatra, Nat King Cole, Christian rock, Gypsy jazz, Beatles, old musicals and tango. In general, the young artists said they practiced between two and five hours per day.